It’s 1983 and Nicolas Cage is living in the middle of a forest with his significant other, Andrea Riseborough. All is peaceful, all is nice, but not for long. You could never accuse Nicolas Cage (“Mom And Dad“, “Drive Angry”) of underacting, and, if you want rage in your film, someone to completely lose their sh*t, you give Cage a call. That’s exactly what writer/director Panos Cosmatos did for his second film after Beyond The Black Rainbow, as well bringing Elijah Wood on board as producer. Despite being only two films into his career, Cosmatos is already making a name for himself and has established a pattern in his films; LSD will feature, a commune or cult and plenty of surreal imagery. 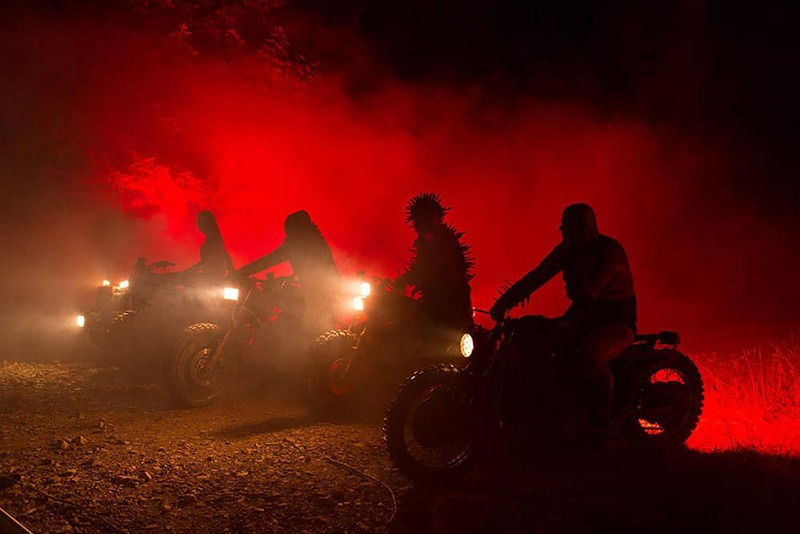 In Mandy, Cosmatos takes that and adds in a whacking great dollop of grindhouse for good measure whilst giving nods to everything from Friday The 13th to Phantasm 2 (though the chainsaw death isn’t quite on a par). It also has a feel of Stranger Things (though you could definitely argue Cosmatos was there first), the films of S. Craig Zahler and Robert Rodriguez (not counting Spy Kids) but most of all, it’s absolutely batsh*t nuts! In the begging, all is well and benign. People go about their lives, read books, have meals, watch TV, talk-sh*t and generally there couldn’t be less of a clue as to what is about to befall these quiet folks. Cage is a logger and returns home to his artistic partner Riseborough (“The Death Of Stalin“, “Oblivion”) who, whilst out walking one day, is noticed by local cult leader Jeremiah Sand, Linus Roache (“Homeland (TV)”, “Non-Stop”). He gets Brother Swan, Ned Dennehy (“Peaky Blinders (TV)”, “Glitch (TV)”), to take a strange stone-flute-thing into the forest and summon the Black Skulls, a bunch of bikers who have lost their minds on some f*cked-up LSD, to obtain Riseborough as his latest recruit. Riseborough though, doesn’t play ball and so Jeremiah returns her to Cage and puts on an unwelcome show in the process. This leaves Cage, in a rage, and he visits his old friend Bill Duke (“Predator”, “Commando”) to tool-up and set out for revenge. This, is when the craziness begins. Cage is absolutely perfect for the role, other than yelling his lungs out, he stays practically mute throughout and when he does speak, the speech is slowed down and distorted. This isn’t a one-man show though, despite having less screen-time Roache is just as crazy in his own way as the cult leader who believes god is talking to him and that he’s “the one”. Blood, eyeballs and guts splatter everywhere, inventive ways and tools pop-up, sometimes literally, and Cosmatos takes us on a bizarre trip with various tricks of light (adding LEDs around the camera), graining the film, making plenty of use of coloured filters and even adding in some animation for good measure. The biggest problem with Mandy is simply the run-time, at two-hours, the film is long. This is particularly apparent in the opening third when short scenes are placed in between fade-to-black’s (of which there are a lot). These scenes last just a few seconds in some instances and don’t always add a lot or move things along, serving only to slow things down. You are itching for things to get going, if you didn’t know they were, you’d be forgiven for switching off. There are religious references and motifs throughout, crosses are burnt and symbolic buildings are raised to the ground. Equally, some people survive, so is Cosmatos taking a pop at those who believe they are god, the representations of god or, should you believe in that sort of thing, the man himself? Mandy won’t be for everyone (she’s just for Cage! ), but for those who love the grindhouse genre, you’re going to absolutely love seeing Cage in a Rage (patented), covered in blood, high on LSD, doing what he does best.